This year’s Winemakers Dinner will take place Friday the 22nd of February at the Odd Fellow Palace in Odense. 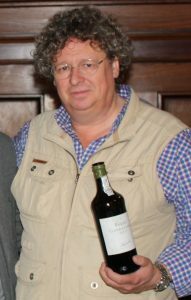 Our guest of honor will be Dirk Niepoort and of course both the tasting in the afternoon and the dinner in the evening will be with wines from Niepoort. At the tasting we are aiming for a tasting of 10 Year Old White, White 1917, Niepoort Ruby, Garrafeira 1948, Vintage 1970, LBV 1989, Colheita 1989, Vintage 1987, Pisca Vintage 2007, Bioma Vintage 2008, 30 Years Old Tawny, Colheita 1957 and Vintage 2017. At the Dinner these wines will be served: Conciso 2016, Poeirinho Garrafeira 2012, Redoma 2015 Magnum, Niepoort Vintage 2005 and Colheita 1997. 44 members will join the tasting – more the Dinner.